Software is ever evolving—exponentially so in the last decade. And Zoho Creator is no stranger to evolution either; only last year we released a version that’s far more technically competent, and user-friendly, than its predecessor. Subtract clutter, add more intuitive features, improve the UI, throw in some futuristic features, and voila—you have Creator 5! The complexity is still there, but it’s been plastered over with a friendly UX, presenting users with a clean, simple, efficient product. 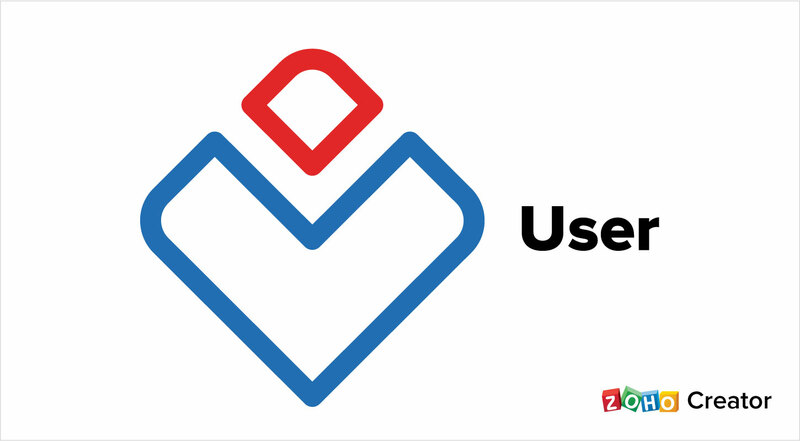 With the product becoming easier to use, it’s only fitting that our logo also matches that functional minimalism. Following the tenets of ‘Logolinism,’ we came up with something that speaks volumes about our product—with just a few “lines.” This simple, minimalistic design reflects the fuss-free, quietly capable nature of Creator 5. Marc Andreessen, in his Wall Street Journal article, coined the now-famous phrase “software eating the world.” He expounded on the idea by citing major software players who have firmly planted themselves across businesses, industries, and households. The “digital transformation” they spurred is still a Work In Progress, as many businesses, especially the smaller ones, hesitate to invest money and resources in a ‘phantom’ commodity that may not fit their requirements. They pay the price for their reluctance in terms of lower efficiency, and hence lower productivity, which inadvertently affects their revenue and profits, and thrusts them back into the cycle. Zoho Creator helps companies break free from this cycle by providing affordable software that is tailor-made to the customer’s needs. It can fill cracks that are too small or niche for the big players, and seal them for good, making the company’s processes more secure and efficient. This way, Zoho Creator helps businesses complete their digital transformation to the very last task, employee, and service. 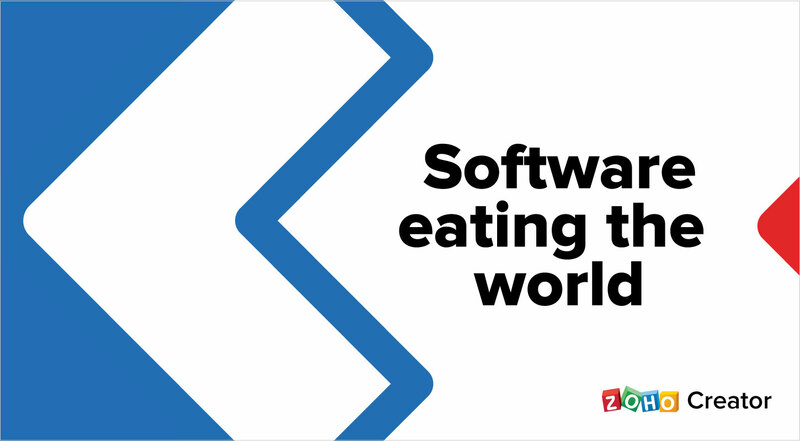 Because, when software eats the world, it shouldn’t leave any crumbs behind. Everyone knows Pac-Man, the smiley that navigates mazes, eating the dots blocking its path. In the same way, Zoho Creator clears the path for businesses—by eating away at inefficiencies, like paper, spreadsheets, disconnected processes, and scattered data—boosting productivity and profit. Another interpretation: software is no longer confined to servers and business suites. It’s flowed into almost every aspect of our lives. It’s in our computers, on our TVs, and even in our pockets. It’s gone from a luxury to a pervasive, necessary part of almost all of our lives. In a sense, Zoho Creator does the same for businesses. 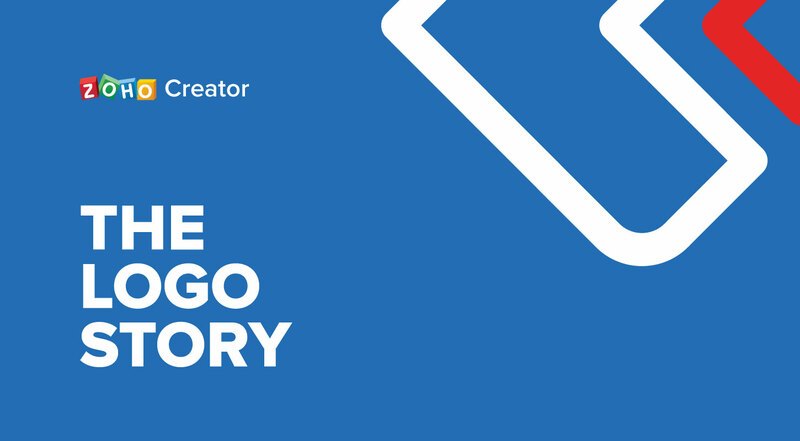 Companies start using Zoho Creator to solve a minor issue or inefficiency. Gradually, realizing its potential, they extend it to other aspects of their business. The platform nudges its way to the heart of the company, solving fundamental, mission-critical issues, and becomes indispensable, and they end up using it for everything—from streamlining internal operations to handling customers. Zoho Creator, at its very core, is a low-code application development platform. So the logo would be incomplete without the low-code element in it. The blue < is the universal symbol of low-code, and is a testimony to our ideology. The red part is the business. Zoho Creator’s low-code engine empowers businesses to create applications attuned to their requirements, without forcing a clunky solution upon them. 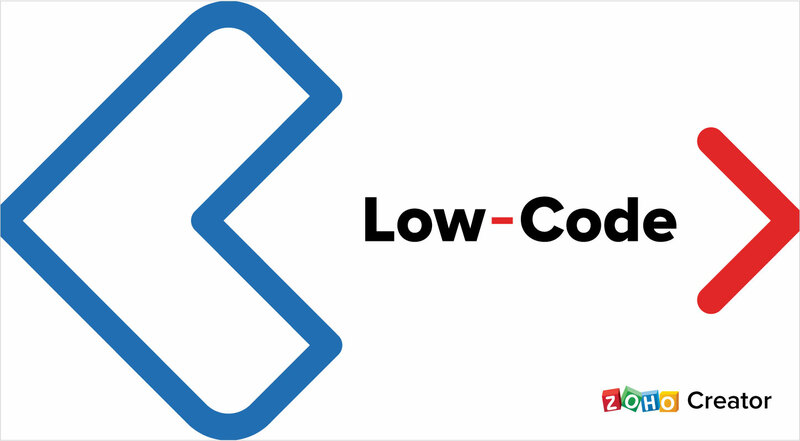 Together with low-code, the business becomes larger than it ever thought it could. While eliminating inefficiencies and spiking productivity, the low-code platform also saves time, money, and the effort required of traditional, full-stack software. In a way, the red part represents traditional software and full-stack development, devoured by Zoho Creator’s low-code Pac-Man. However much we wax eloquent on our creation, its true colors come out only in the hands of those who use it. Although we build products for users, no two have the same expectations—one might always want more of this feature than that one. Which is why DIY is the next big thing. From experiences to merchandise, services are customized, tailored, and curated to individual tastes and preferences. 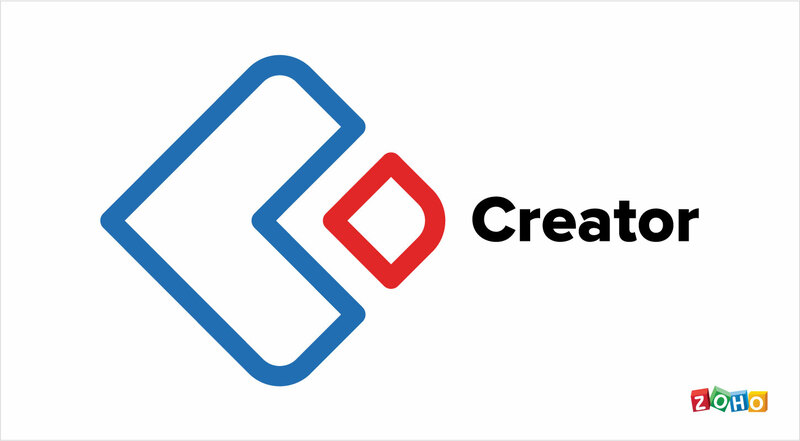 Zoho Creator is one of the first software products to jump into the DIY segment. It provides users with the tools to create and modify apps to their heart’s, or business’s, content. This introduces the concept of absolute control, where people use, and subsequently pay for, only the features they want. Each app is thus customized to the user’s needs and budget. 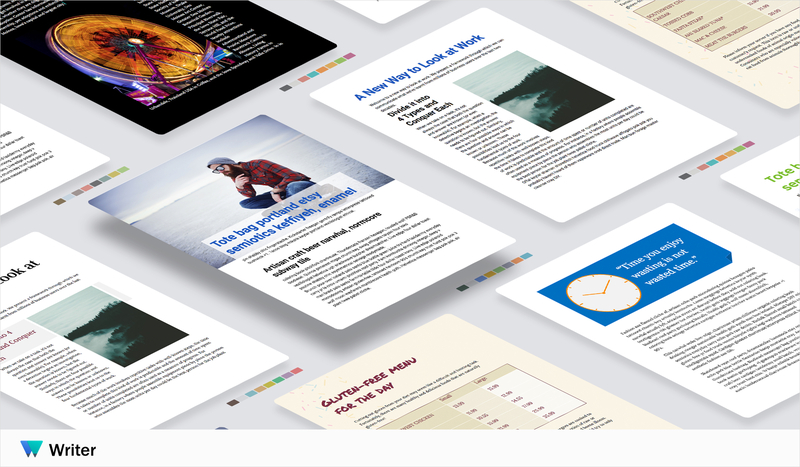 This little story may have reached its end, but Zoho Creator is forever open to change. 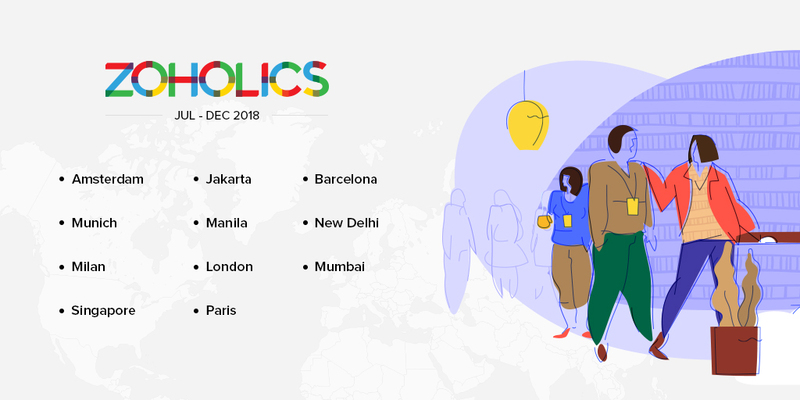 As long as there are businesses looking for solutions to reinvent themselves, Zoho Creator will continue to evolve and surpass its users’ expectations. After all, the road to perfection is endless. I have used microcomputers, PCs, laptops, you name it since 1975 yes 75. The first implementation of relational database on those device was DbaseII that gave us the dream of a low code, interpretive language with no compilers and fast debugging that would support DIY systems solutions developed by end users. Most of these terms, low code, etc., were not invented yet, but the dream started then. Ashton Tate and Dbase3, Clipper, Foxbase, Foxpro were all steps in the same direction. Incremental improvements on the same philosophy of DIY business computing that would put users in control and let developers focus on business rules methods and workflow not on code. Thank you for championing our product! We owe a huge part of our success to the encouragement of happy customers like you. And we promise to keep improving! This is the reason I love Zoho! Thank you! And we’ll do everything in our power to keep it that way! I like the new logo. Good for you all!